← How many have we Ordered? These two likely lads with the Hickleberry Hound. The sailor on the left is AB Maurice McCallum and the other was a sparker. 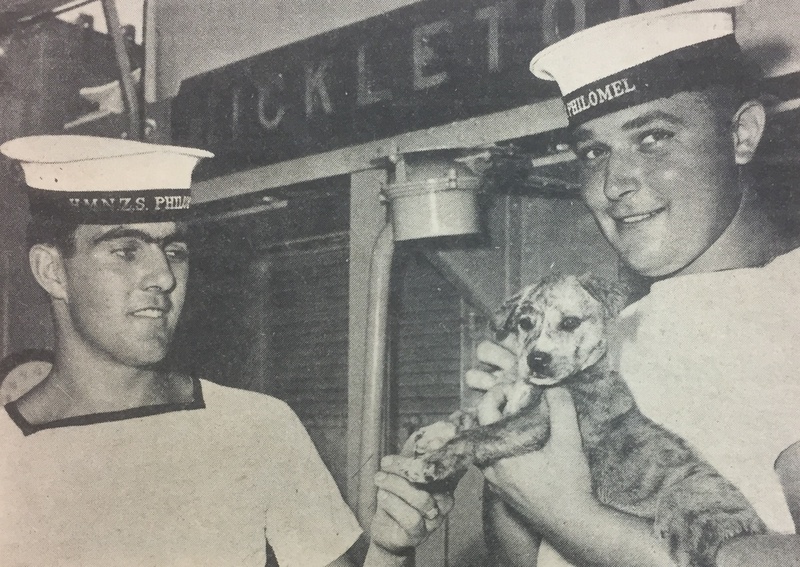 The sparker pictured rescued the pup when it went overboard. Can you name the sparker? The source of the image is from a short-lived joint service newspaper called Action which was the pre-cursor to Reveille. Thanks Fred W for the image. Click on image to enlarge. Henry Bull, sparker first commission on Hickleton with the little dog who grew bigger until tossed over the side as a dibdab . The sparker who saved the dog was Graeme Bull who has crossed the bar. Yep, Henry Bull, I was on Hickleton with him and Baz Newport as the initial sparkers. Nick Carter was the bunting. Hi Jim, remember you all coming on board Royalist in Bangkok. Henry got some copper wire to replace your aerial and didn’t Baz do his ABs exam at the same time? Footnote for Hick (the dog). We were very concerned that Hick may be gay. We gave him every opportunity to prove us wrong, but to no avail, One day in harbour after rum issue it was decided to take Hick to see a local vet and get this dilemma sorter out once and for all. Whilst waiting in the vet’s surgery, Hick attempted to bonk a cat! Needless to say, Hick was immediately returned onboard without the need for a vets examination. We celebrated Hick’s new found interests with another rum issue, without the Coxn’s consent of course. He was a miserable bastaes anyway.